The Japanese government placed an advert in the Yomiuri and Tokyo dailies on Tuesday claiming sovereignty over Korea’s easternmost islets of Dokdo. This is the first time it has advertised the dubious claim in the papers. The advert will run successively in 70 Japanese newspapers for a week, including nationwide dailies and regional papers. The move came just two days after Japanese Prime Minister Yoshihiko Noda approached President Lee Myung-bak at the APEC Summit in Vladivostok on Sunday and spoke of a “future-oriented relationship.” One diplomatic source said Noda pretty much blindsided Lee. Placed by Japan’s Foreign Ministry, the ad is headlined “It is time to realize. The Takeshima issue is basic knowledge.” Takeshima is the Japanese name for Dokdo. The ad claims Japan gained sovereignty over Dokdo in the mid-17th century and its will to exercise sovereignty was reaffirmed in a Cabinet decision in 1905. “Korea claims it began administering Dokdo before Japan, but the descriptions in its reference materials are ambiguous, while there is no clear evidence to support its claim,” the advert claims. They instruct readers to refer to the official website of the prime minister in order to find detailed information about the issue. Noda said in a recent press conference that his government would bolster publicity for Japan’s dubious claim to the islets, and the Japanese Foreign Ministry recently included in its 2013 budget 600 million yen to fund the campaign internationally. It also hopes seminars and films abroad will help the cause. The Korean government described the as “historically regressive.” Foreign Minister Kim Sung-hwan, who is accompanying Lee on his visit to Norway, told reporters there that Seoul finds it “extremely regrettable” that Japan is placing such ads. “Inevitably you wonder what they may have to do with the upcoming elections in Japan,” Kim added. 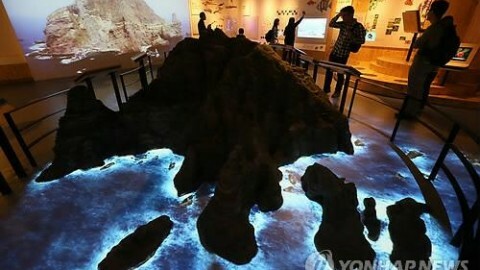 The Korean government set aside W4.2 billion (US$1=W1,128) for projects next year to raise international awareness of Korea’s ownership of Dokdo. The amount is up 81 percent from last year’s budget and will also be used to fund research into old documents and maps supporting Korea’s position, which is that Japan had no interest in the Korean islets until some time in the colonial occupation.